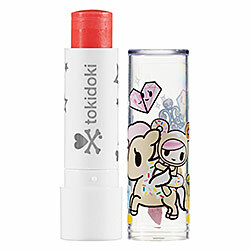 Tokidoki's spring makeup collection is now available on Sephora.com! I adore just about every item in the collection except for the Sodashop Palette which looks a tad bland to me. 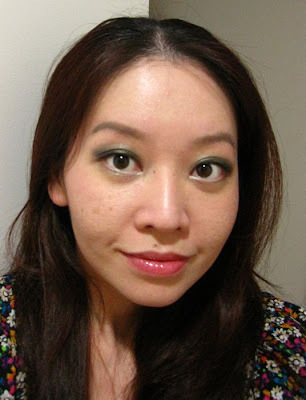 Wish Sephora Singapore would hurry up and bring the whole range in on a permanent basis. 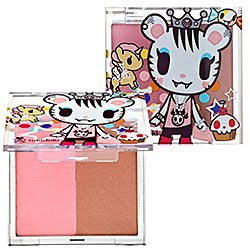 Bellina Blush (US$22): Available in 2 variations, these paraben-free blush duos contain Japanese rice lipids to help hydrate the skin and provide a smooth, blendable texture. The Coffret D'Or website has been updated with the new base makeup collection that will be released in March in Japan. The collection includes a Silky Lasting Pact UV powder foundation, Silky Lasting Gel Foundation UV, Silky Lasting Base UV, UV Cover Base, Cover Clear Finish UV loose powder and Lucent Glow Finish UV loose powder. The 2011 Pact Case comes in white and black. 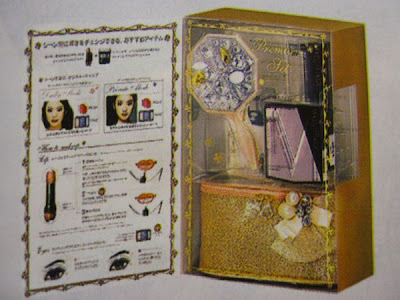 The Kate website has been updated with the Spring 2011 makeup collection, including the new Crystal Quartz palettes. The new TV CM featuring Kimura Kaera and the "making of" clips can be viewed here. 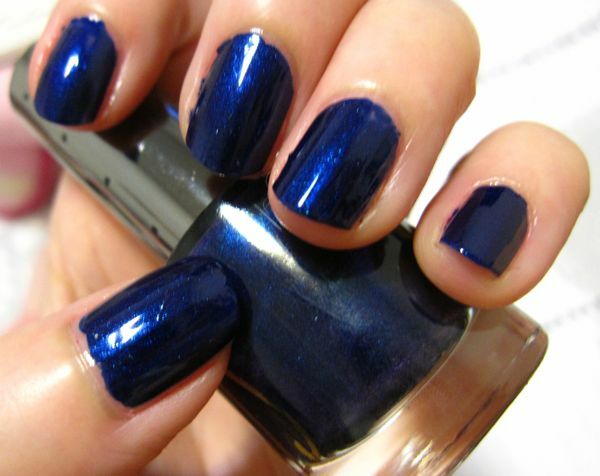 Last week, I was sporting Topshop Nails in Future, a limited edition shade from the Heavy Duty Fall 2010 collection. This was quite affordable at just £6 for 8ml. In Singapore, I think the nail polishes retail at around S$13. 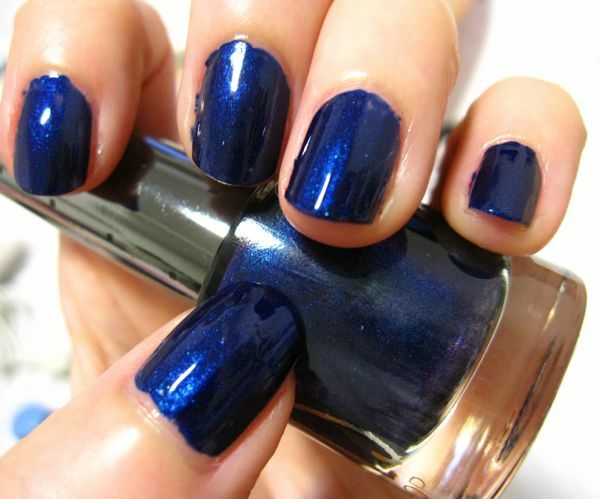 I love the rich midnight blue shade which worked well with my skintone. A number of friends also complimented it! The nail polish applies smoothly and two coats was sufficient to produce an opaque finish. 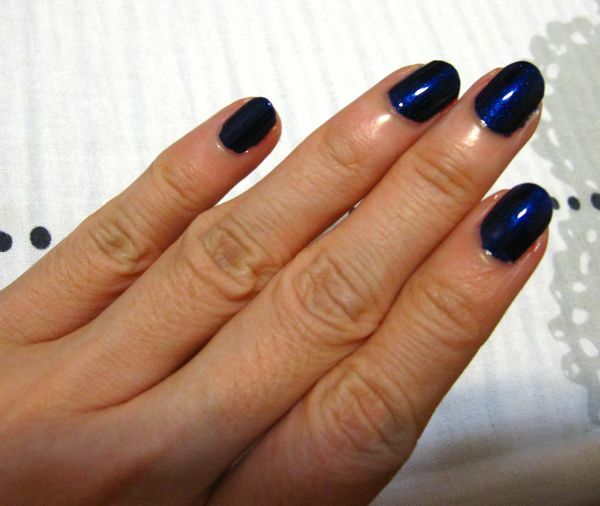 With a Sally Hansen topcoat and Paul & Joe base, the polish lasted on my nails for a week with just a teensy bit of tipwear and no major chips. 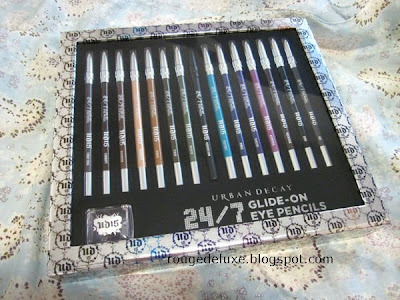 Here are some close-up pics of the Urban Decay 24/7 Glide-On Eye Pencils 15 Year Anniversary Collection. 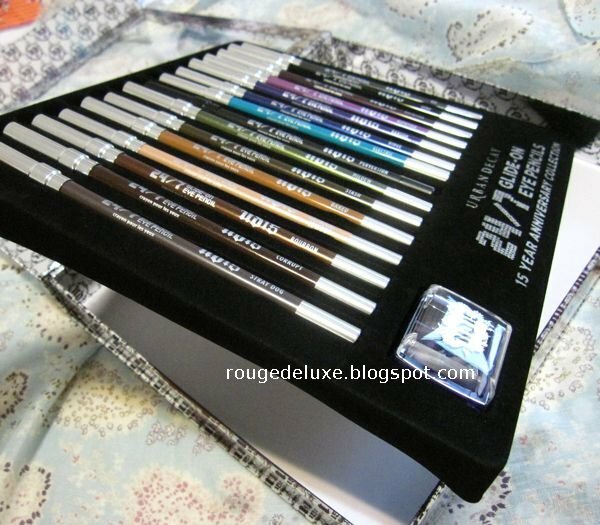 There are already several blogs that have posted excellent swatches of the eyeliners so I won't be doing those. Of the 15 pencils, I already had mini versions of Zero, Stash, Rockstar, Ransom and Electric (either received as gifts with purchase or as part of a palette like the Alice in Wonderland and Book of Shadows NYC). Nevertheless, the Anniversary Collection was too good of a deal to pass up as the quality of the Glide-On Eye Pencils is simply top-notch. As the name suggests, these glide on effortlessly and are very easy to work with. You can also use them as eyeshadow or as a base for eyeshadows. Once they set, they are budgeproof. 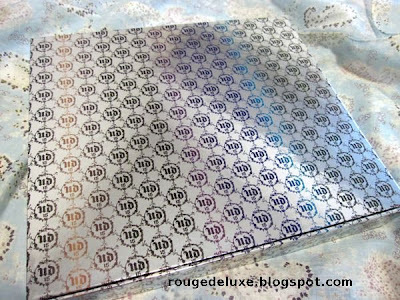 The set includes 9 best-selling shades: Baked, Binge, Bourbon, Electric, Mildew, Ransom, Rockstar, Stash and Zero. 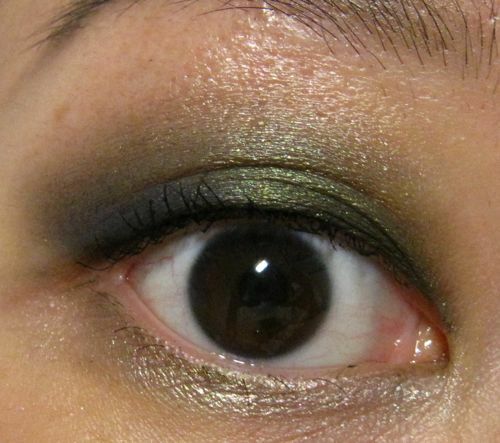 The six new shades that are exclusive to this set are Asphyxia, Corrupt, Midnight Cowboy, Perversion, Stray Dog and Uzi. 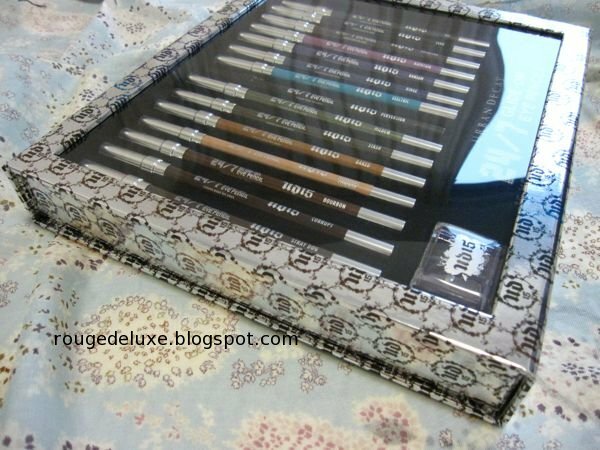 The pencils and sharpener are ensconced in a black velvet-covered plastic tray that lifts right out of the box. While the box is pretty and sturdy, I find it too bulky to keep around on my dresser. Like the pencils, the double-barrelled Grind House pencil sharpener is also stamped with the special "UD15" logo. This is highly praised Perversion, which is a more intense matte black than Zero. For storing the pencils for daily use, I tried the Banner Barrett pen case from the March issue of More magazine. The 15 eye pencils fit inside quite easily but with the sharpener, it's a bit of a tight squeeze. 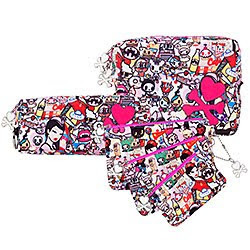 This issue of More magazine has sold extremely well, probably thanks to the inclusion of the three pretty pouches. It arrived on Friday and there were two huge stacks of it when I purchased my copy. 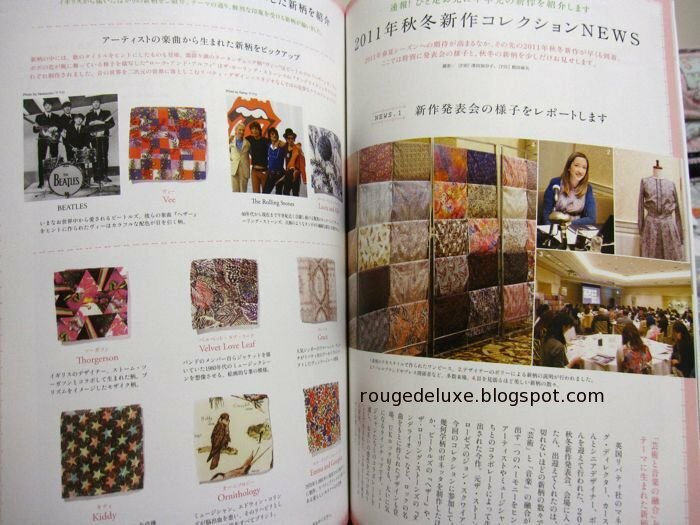 By Saturday afternoon, there were only two copies left. 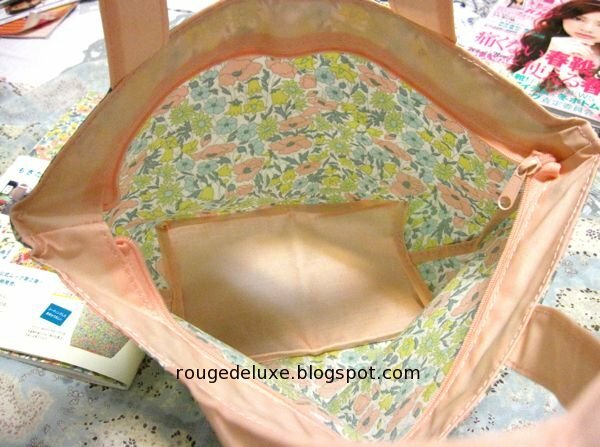 I found this Liberty case (from the December issue of Lee magazine) to be a much better fit as it is slightly longer and has a square cross-section. 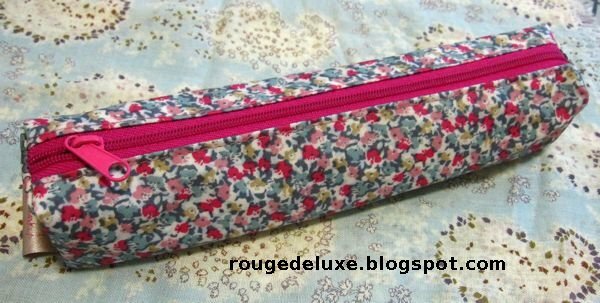 Even filled with 15 pencils and the sharpener, the case feels extremely lightweight and still has space for a few more pencils. 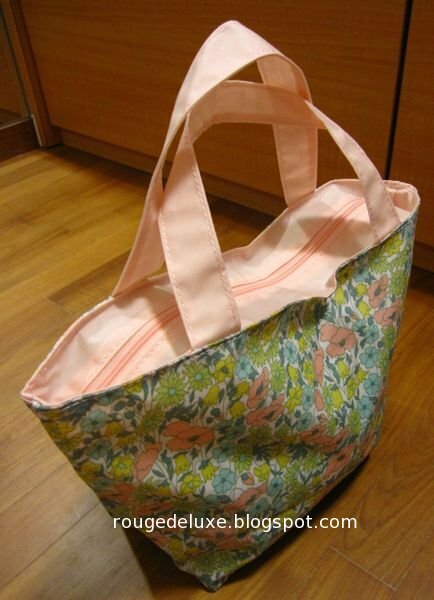 This will come in very handy for overseas trips as the case takes up hardly any space. Yesterday, I went to Sephora Ion for the Urban Decay makeover by Clarence Lee, who is one of Singapore's top makeup artists whose work has been featured on countless magazine covers. 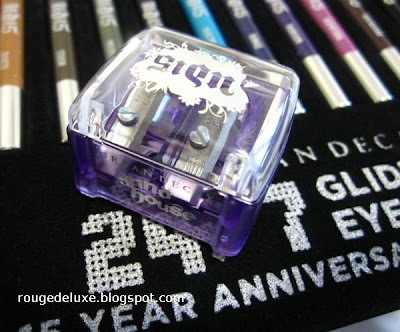 As mentioned earlier, customers who purchased the 24/7 Glide-On Eye Pencil 15th Anniversary set and one more UD product got to have a makeover by Clarence yesterday. 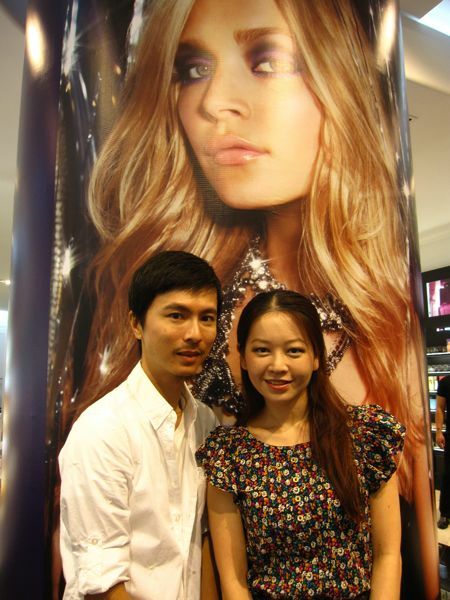 I had met him previously at the Cosme Decorte workshop and so was extremely thrilled to have the chance to have my makeup done by him. 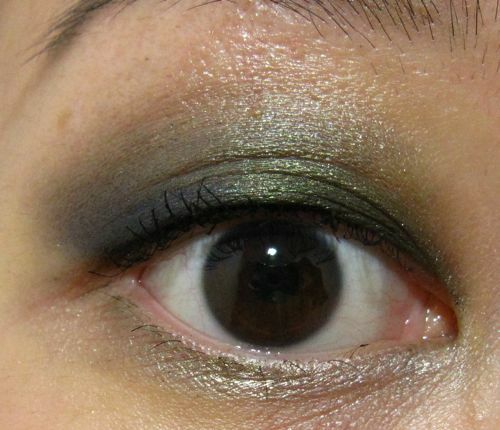 UD's Black Palette looked intriguing so I requested a smoky eye look with it. Clarence used the Mildew and Perversion Eye Pencils as the base before applying Libertine and Sabbath from the Black Palette. Perversion Eye Pencil is one of Clarence's favourites in the 15th Anniversary set. 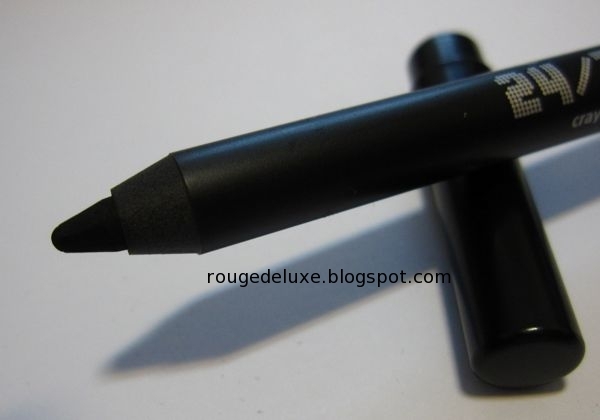 It is an intensely rich, matte black shade that is new and exclusive to the set. He also used Mildew eyeshadow (shimmery green) from the Ammo palette in the middle of the upper eyelid and Sin at the inner corners of the lower lid. For the lashes, he used Big Fatty Waterproof Mascara first followed by Skyscraper Mascara to add volume. All in all, it was a wonderful experience as Clarence has a very kind and gentle presence that puts one immediately at ease. It was also a pleasant surprise that I got to take home these two Polaroids, courtesy of Sephora! 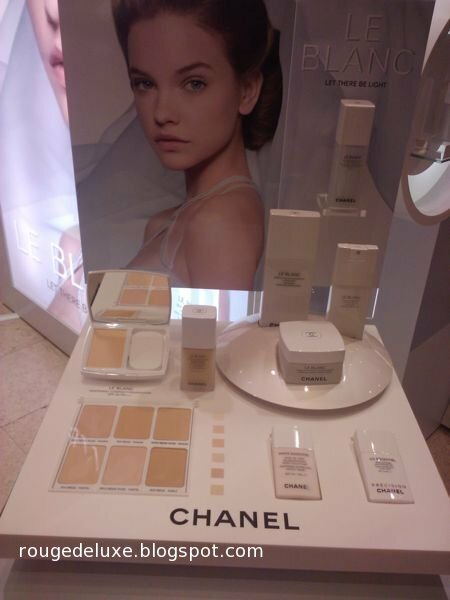 Chanel has launched its Le Blanc makeup and skincare collection exclusively at Takashimaya. 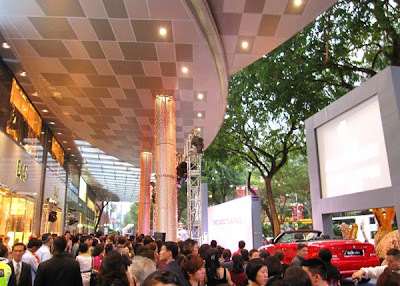 The collection should be available at other counters in Singapore in February. 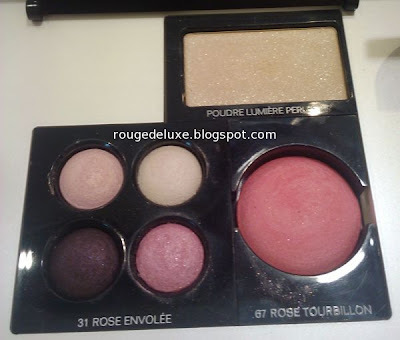 The Poudre Lumiere Perles is a gossamer-fine skin illuminator, retailing at around S$77. I think both the eyeshadow quad and blush are re-promotes of previously limited edition shades. The new Le Blanc skincare line includes the Whitening Moisturizing Cream (S$140), Lightening Moisture Nanolotion (S$79), Whitening Concentrate Continuous Action XTC (S$165) and Whitening Moisturising Fluid (S$140). 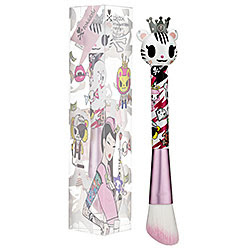 The line was designed in Chanel's laboratory in Funabashi, Japan for Asians. 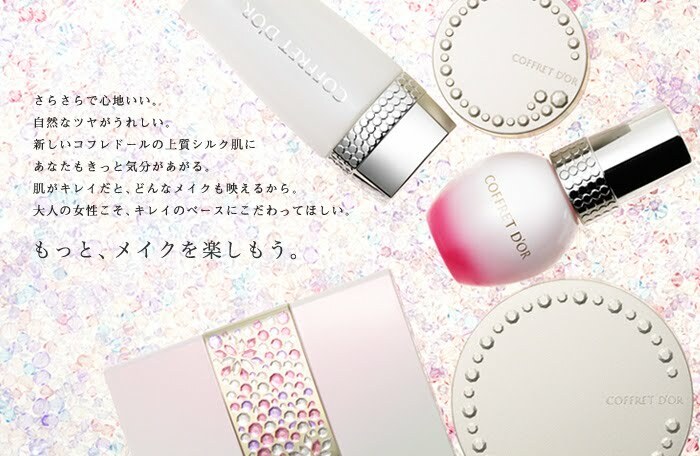 Chanel undertook an arduous and very expensive three year application process to become one of the first non-Japanese companies to obtain "quasi-drug" status for its whitening skincare products in Japan. Achieving quasi-drug status allows Chanel to promise specific whitening results. The Le Blanc skincare products contain TXC, a modified version of tranexamic acid, which helps to reduce the inflammation that contributes to skin pigmentation. TXC is more easily absorbed by the skin than the usual tranexamic acid, and works for up to 12 hours once absorbed to reduce melanin production. 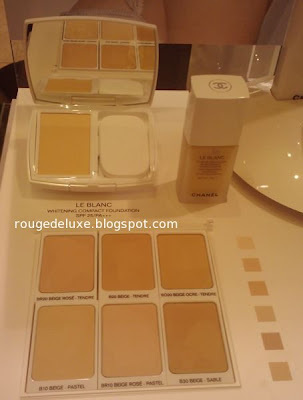 Both the Le Blanc White Mastering Whitening Compact Foundation SPF25 PA+++ (S$94) and Light Mastering Whitening Fluid Foundation SPF25 PA+++ (S$79) come in 6 shades each. They do not contain TXC, so they won't lighten the skin permanently but the SPF will help to prevent sun damage. 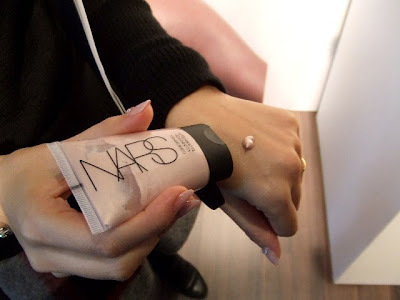 The foundations are supposed to help skin look more luminous and glowy as they contain hexagonal-shaped pigments that form an interlocking film to better reflect light white providing coverage. 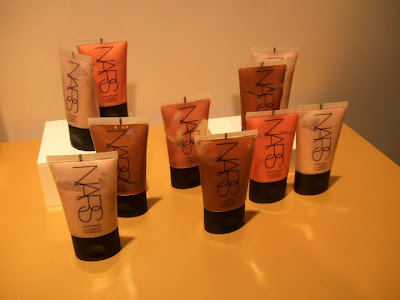 The powder foundation felt extremely silky and velvety when swatched. Mandarin Gallery celebrated its first anniversary yesterday evening with their Two Good To be True! Grand Draw. Shoppers who spent $1,000 at Mandarin Gallery between last September to 26 January were entered into the lucky draw to win one of two BMW cars. 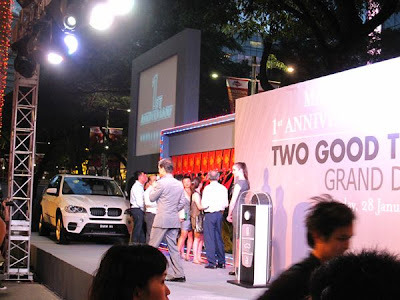 One was a white BMW X5 while the other was a gleaming red BMW 120i Convertible. 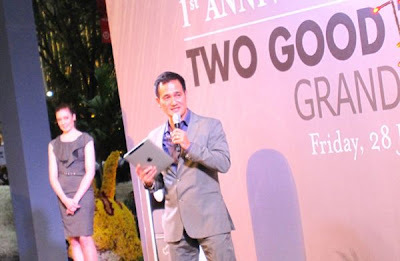 The event was hosted by Gurmit Singh, who was his usual supremely entertaining self. 20 lucky shoppers, who had been selected in advance, were invited on to the stage to unveil the contents of these red packets. 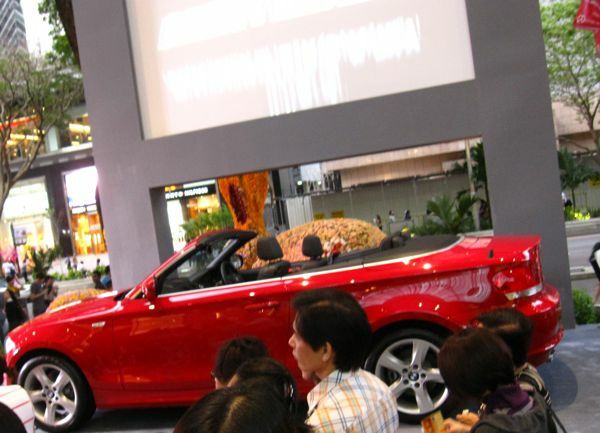 Of the 20, the 7 who unveiled packets containing the word "BMW" advanced on to the final round while the others received $680 each in shopping vouchers. 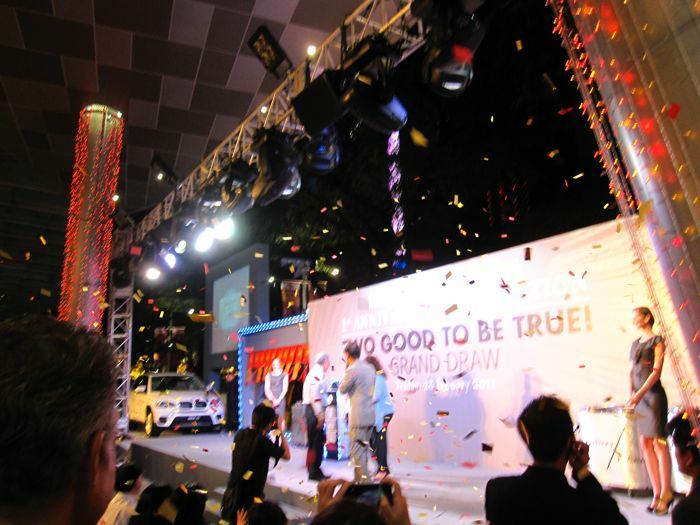 Confetti filled the air as the two lucky winners learnt which BMW they were going home with! 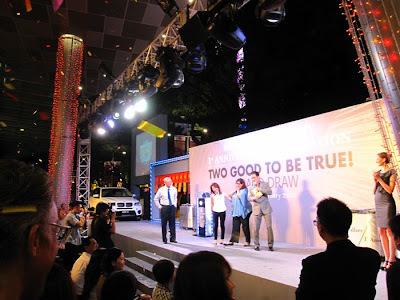 The other shoppers in the final round walked away with $880 in shopping vouchers each. 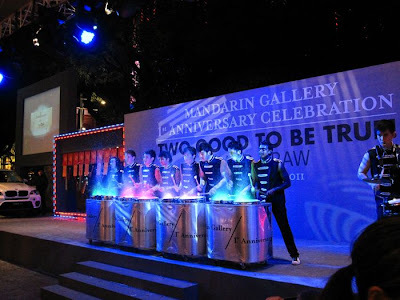 The most enjoyable part of the event was actually the three high energy percussion perfomances by local group Urban Drum Crew. 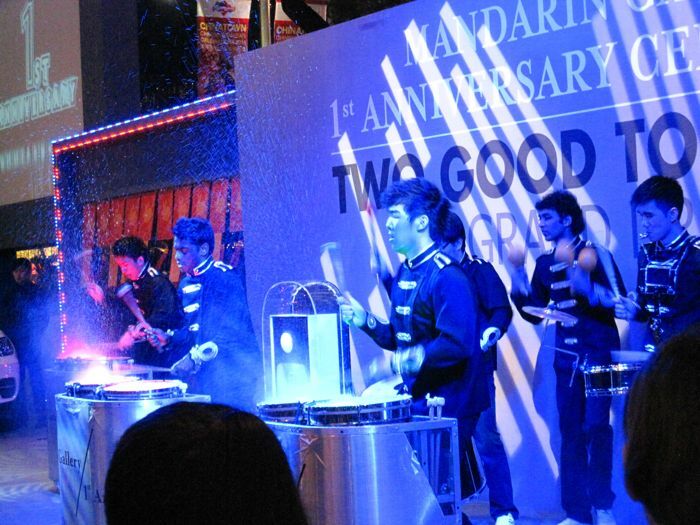 Here are the last two minutes of their final performance that I filmed with my Canon digicam. 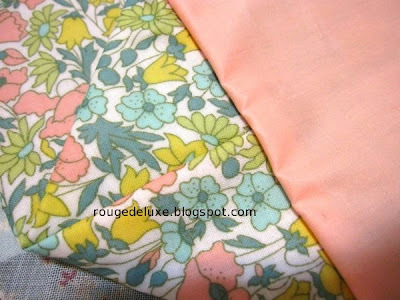 Do also check out their Facebook page! 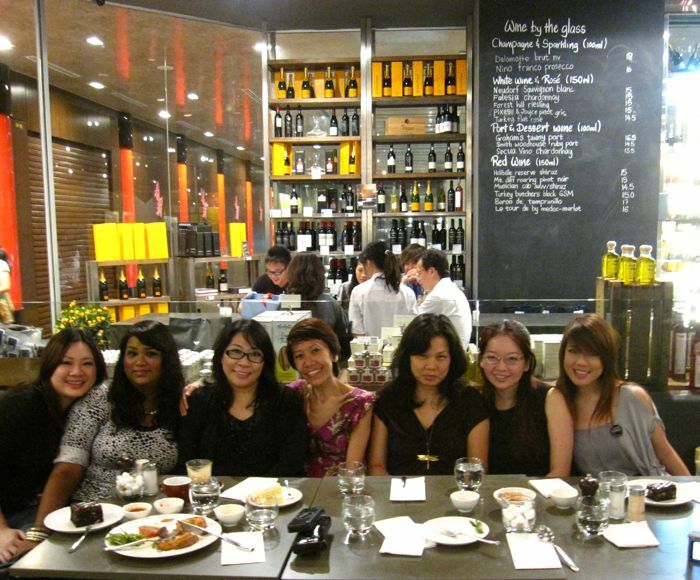 Thereafter, my fellow beauty bloggers (Chantana, Kas, Mag and Sara) and I adjourned for more shopping and dining in the Gallery. And I came home with this pair of crystal-studded Fitflops that I've been eyeing for quite some time. 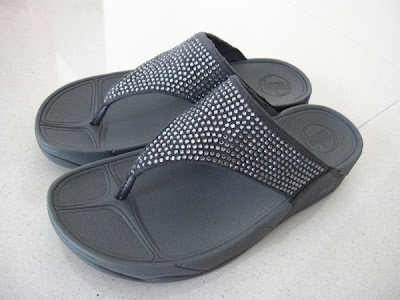 These are incredibly comfortable and gave my feet immediate relief. 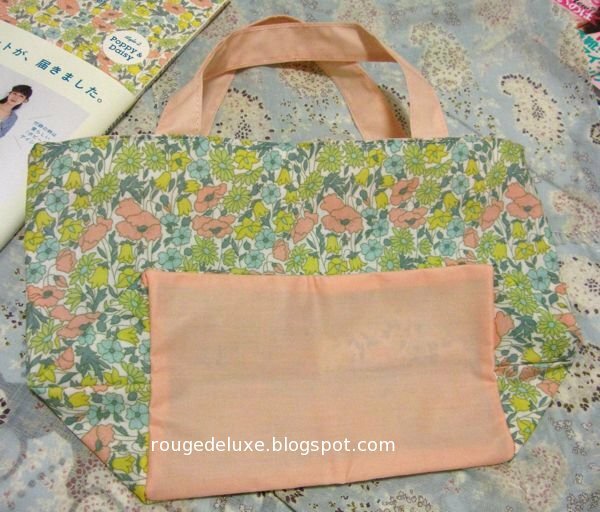 They'll be perfect for shopping marathons! Spotted this limited edition Maquillage 5th Anniversary Premium Set in the new issue of More. This has been available in Japan since 21 January. One can choose from any of the four Lighting Eyes Creator palettes in the spring collection. 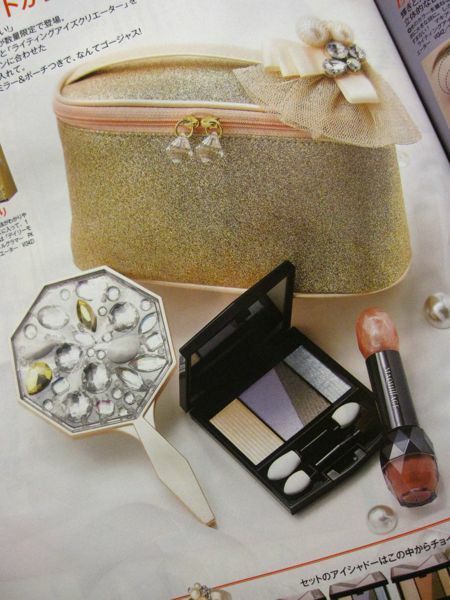 This is the "Daily Mode" set that includes Rouge Enamel Glamour PK744 and Lighting Eyes Creator VI342. The Liberty 2011 Spring & Summer mooks arrived at Kinokuniya stores in Singapore yesterday. 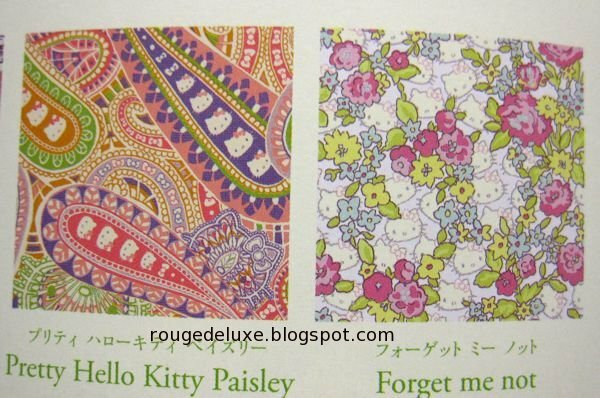 As mentioned before, the 70-page mook is available in two designs, Poppy & Daisy and Tatum. 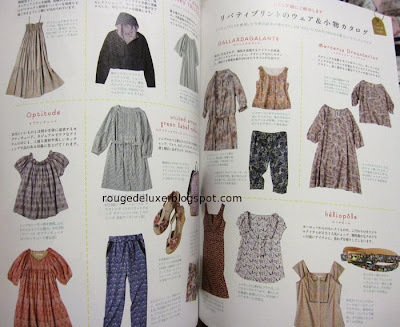 Each retails at S$31.50 (and you can get 10% off if you are a Kinokuniya cardmember). 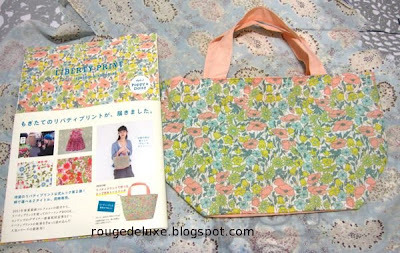 The mooks are identical except for the cover, the tote bag print, and a few pages featuring the Japanese fashion brands using Liberty prints in their spring/summer collection. The bag measures 19x32x11cm and is made of cotton and PVC. The material is coated to be more stain-resistant, so it feels quite different from the soft cotton bag from the first Liberty mook published last year. 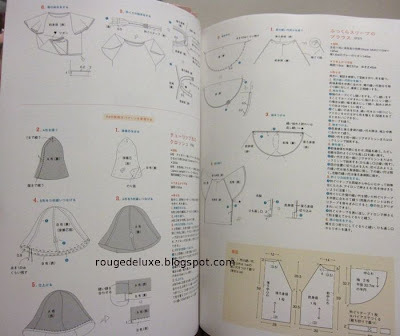 The material is quite thin and somewhat see-through, especially at the base. 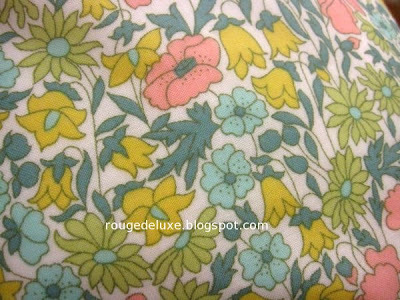 Poppy & Daisy is one of Liberty's classic prints. 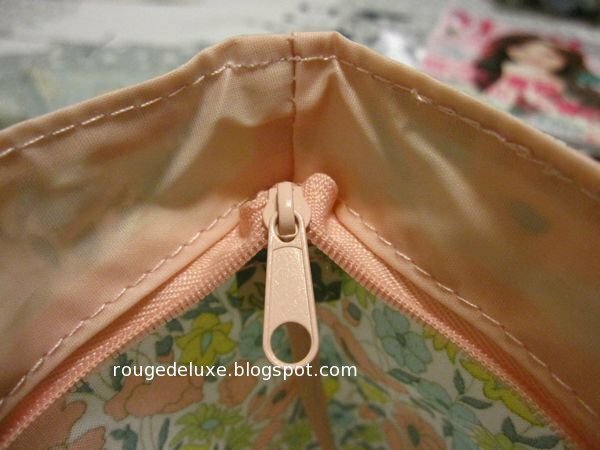 The inside seams are covered. The quality of the bag feels closer to those that one usually gets in Japanese monthly magazines rather than the more expensive seasonal mooks which usually have sturdier, more well-made bags. The print is cute but I wish that the bag could have been more well-made, for example with an inside lining or pockets. 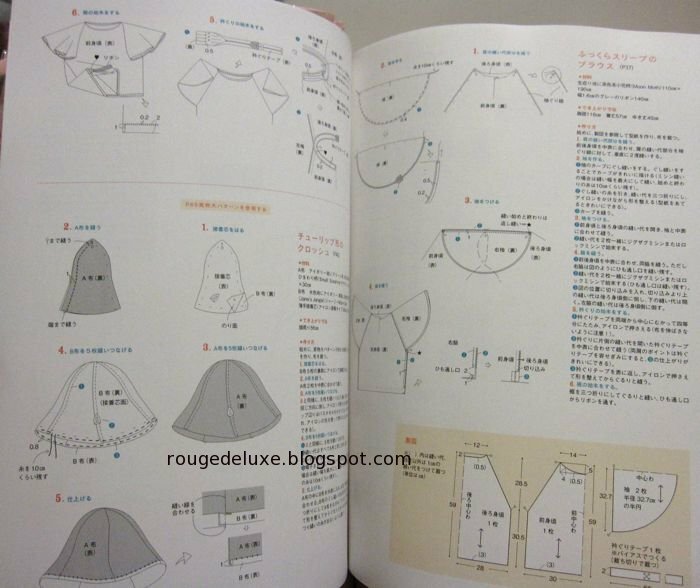 Nevertheless, for me the highlight is really the beautifully edited mook with its detailed articles on the world of Liberty. 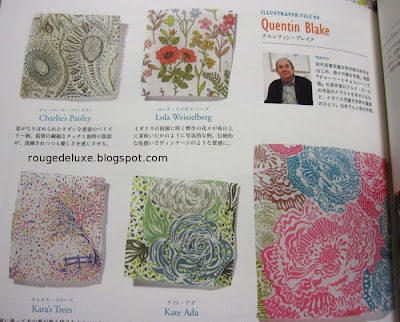 The Spring/Summer 2011 collection features work by several illustrators including David McKee, Brian Wildsmith, Sally Haysom and Quentin Blake (renowned for his work on Roald Dahl's Charlie & The Chocolate Factory). The ever-popular Hello Kitty series. 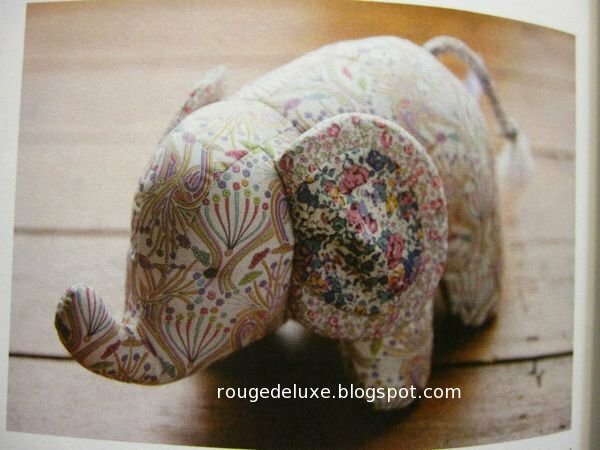 An adorable elephant figure made from 3 Liberty prints. This was from John Lewis, a UK department store. A sneak preview of Liberty's 2011 autumn collection, which will include prints inspired by the songs of bands like the Beatles and the Rolling Stones. 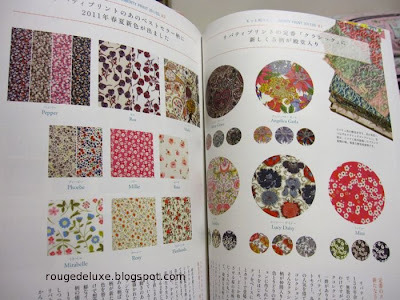 The brands using Liberty fabrics in their spring collections include Tsumori Chisato, Earth Music & Ecology, Lacoste, Rubyrivet, Rope Picnic, Tomorrowland etc. 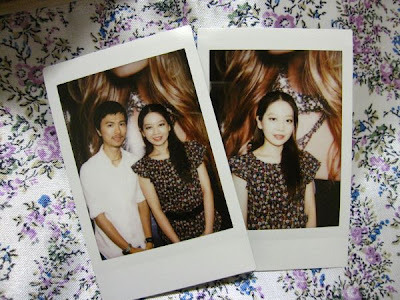 The Kinokuniya store at Ngee Ann City had plenty of copies as of yesterday evening. 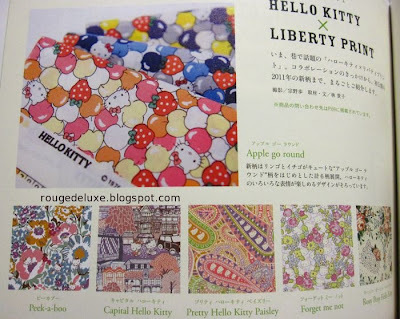 If you love Liberty prints, this mook is definitely not to be missed!